Giving makes people feel good! It’s so evident that the feeling has been named the “givers glow”, not only does doing something for someone else make you feel great, but the associated dopamine release in the brain lessens symptoms of stress and depression. Employees who are less stressed and depressed will be more productive, more creative and more engaged. By helping your team stay well (this includes feeling happy and relaxed) you help them to help you, and this is just one of the benefits of employee volunteering. There can be a knock-on effect from all of this feeling good too…think of it as an upwards spiral, those who feel good about themselves are likely to take better care of themselves in other ways. If you can increase your team’s wellbeing in any way, it will have positive repercussions for your business. Volunteering in your local community is a great way to network your business outside of your usual circles. Research indicates that businesses increase their revenue when there is cultural, gender, age and class diversity in the workplace, due to the range of perspectives brought to the table and combined to problem solve and strategise. Whilst volunteering isn’t the same as having diversity in your team, it will give your staff the opportunity to reap the benefits of diverse perspectives and opinions, which, if you’re business is quite small, may not be available in them in the workplace. Not to suggest they should be quizzing everyone they volunteer with about work issues, rather they will be naturally exposed to more varied perspectives, which can only be useful. Volunteering demonstrates that you care about the community surrounding you. By having your team volunteer with organisations that are relevant to your business it will boost your integrity and reputation as a brand and make your business more human. This is called the “halo effect”, a psychological term describing how our first impression of someone (or a business) can strongly influence how we feel about that person/ business further down the line. The halo effect means that someone’s strongest impression is likely to override any other (perhaps contradictory) information received after that impression. Make a great first impression about your business (by showing that you care about causes and communities through volunteering) and you’ll be using this cognitive bias (halo effect) to your advantage. It will likely gain you loyal customers before they’ve even bought your product, plus you’ll have plenty of opportunities to grow your business, as well as plenty of good word of mouth. Providing your team with the opportunity to work together outside of the office will allow them to get to know each other free of the constraints of workplace hierarchies. 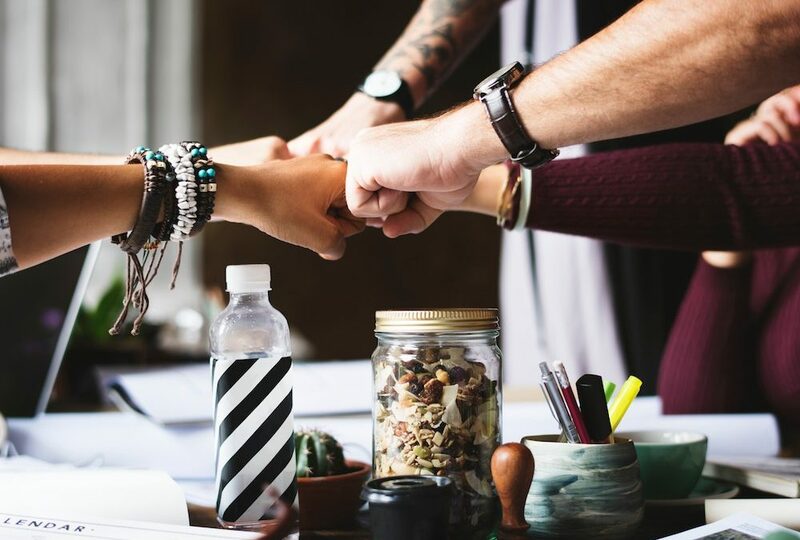 Engaging in a meaningful, shared activity together will encourage bonding and interaction on a deeper level resulting in stronger relationships which will help your team to work better together when at work. The break from spreadsheets and change of scene from office walls will provide a refreshing change of scene and they say a change is as good as a break! Volunteering is the perfect opportunity for your staff to pick up some new skills and to focus on personal growth. For example, working with elderly people may require some training in care, working for a festival may require some training in organisation and logistics etc. The experience of volunteering may help an introverted member of staff find their voice, or an unhelpful member of staff become more considerate. Volunteer positions in the right charity (in line with your company) could provide valuable insight into a cause that’s highly relevant to your business, providing your staff with helpful knowledge transferable to their work. Having the opportunity, not only to give back, but also to meet people is likely to be a very positive and enriching experience for your staff who will feel more connected to their community. This kind of personal growth could have very positive repercussions in the workplace, as their sense of purpose and place increases, so will their confidence and positivity. It’s quite often the case that volunteers are required to think creatively, charities are often short of resources and value “outside the box thinking” to get things done, offering a great opportunity for your employees to practice and strengthen their problem-solving skills. Discover what your employees care about and then find a good match for your business and you’re away! Volunteer Match is a helpful website to get you started.